Garlic is an excellent non-toxic pesticide and fungicide for the garden that work effectively to protect your plants from pests and diseases. Aphids, ants, beetles, borers, caterpillars, termites, white flies, slugs and thrips are some of the pests that can be suitably controlled using garlic which accumulates sulfur. The companion planting means co-planting and growing different plants together with benefits to both. Garlic is a friendly plant to many other plants. Growing garlic with other plants will work to effectively repel the harmful insects or pests while retaining beneficial ones, thus keeping the soil healthy. The garlic plants like chives, onions plants emit an odour that mixes with the smell of desirable plants and confuses the insect pests and deter them. So garlic can be planted throughout your garden to help naturally deter pests. Garlic plants near your roses can repel aphids which frequently attack the plant. Garlic releases sulphur that is said to improve the scent of roses. Garlic planted with tomatoes will prevent red spider mites from attacking tomatoes. Plant garlic near fruit trees like apple or peach to repel fruit borers. Garlic if grown near cabbages, can reduce infestations by the diamond back moth. Following is a list of plants that are benefited if planted together with garlic. Garlic seems to affect negatively the growth of certain crops. 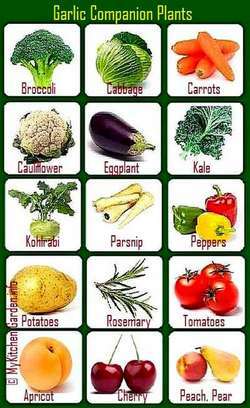 Avoid planting garlic near the vegetables and fruits listed below.